My Nickelodeon Jr. is set to launch on Verizon in the coming months—and presumably on other systems soon thereafter—but there's one thing you won't be seeing on the network at launch: advertisements. The network is a hybrid digital/linear offering that will sit next to toddler-focused Nick Jr. on the Verizon dial, but won't feature that net's sponsor support (Nick Jr. doesn't have interstitial ads, but it does run sponsored spots aimed at parents between shows). Programming will be Nick library content, at least initially. The new network will be programmable, along seven pre-made tracks with names like "super-sonic science" and "get creative," according to The Wall Street Journal, which broke the news this morning. Viacom tested the channel in France last year, where it said results were encouraging. 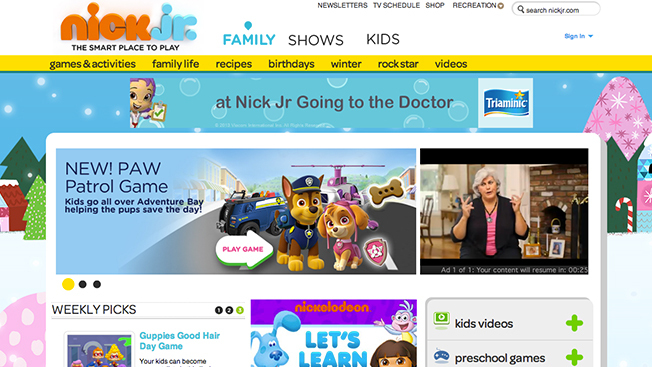 Interestingly, part of the reason for piloting the program in France, an insider said, was to see whether or not an over-the-top service with Nick Jr. content would cannibalize viewership for the traditional network (there's plenty of disagreement on the topic of whether OTT helps or hurts traditional viewing). It didn't, and Viacom International's Bob Bakish told the Journal that the service would now roll out "around the world." And a Viacom source tells Adweek that Nick hasn't ruled out the possibility of ad support just yet. It's getting less difficult to monetize digital content with traditional ratings measurements—Nielsen's DPR ratings product, which tracks mobile and digital viewership and ad delivery, launches this year, and the blended CPM programmers have been pushing in lieu of a real ratings metric may finally get pushed aside by something a little less jury-rigged. For parents, the new network is certainly a boon: it's an easy way to control not just the kid-friendliness but the specific content types your kid has access to on television. It's an interesting shot across Netflix's bow at a time when the streaming VOD provider is looking more threatening to kids' networks—the company's animated feature film spinoff, Turbo: FAST, premiered just three weeks ago, and it's bought a slew of kid and tween programming in recent months.